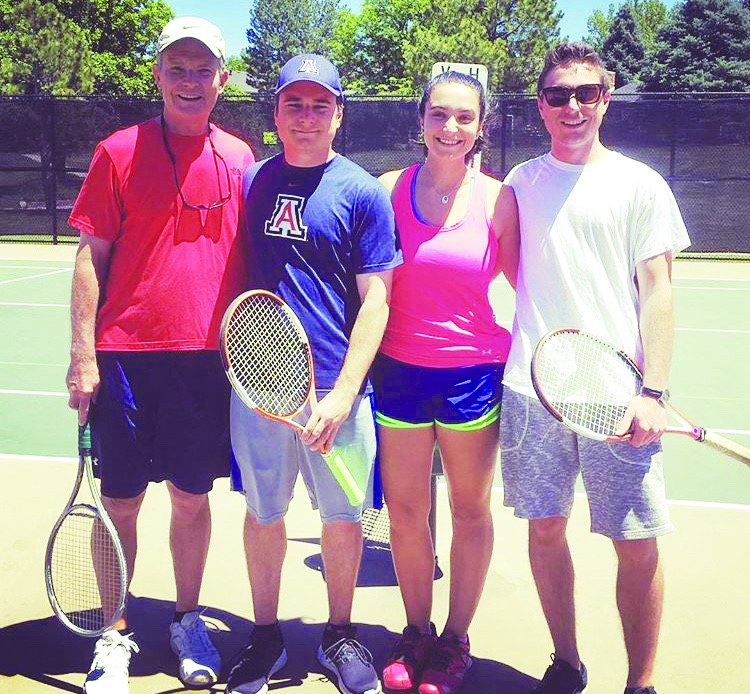 Hailey Johnson (‘16) enjoys playing tennis with her father, Craig Johnson, and two older brothers, Erik and Dan Johnson. 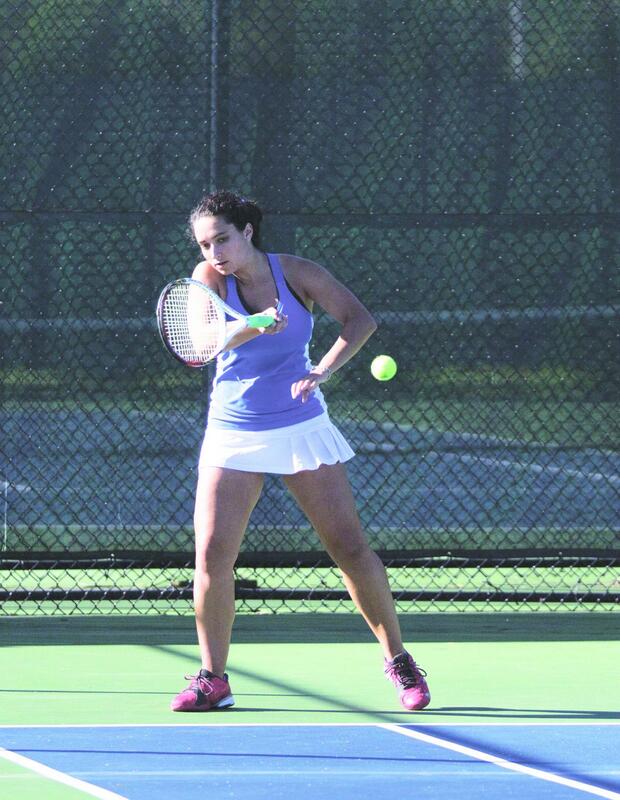 Hailey Johnson (‘16) grew up playing tennis with her father and brothers, but she did not know that her love for the sport would allow her to reach a collegiate athletic level. Involvement with tennis has allowed Johnson to cultivate a hard-working athletic community both at Luther and beyond. One of Johnson’s older brothers played tennis at Augustana College. His tennis coach, Adam Strand (‘04), began as Head Men’s and Women’s Tennis Coach at Luther in 2011. As a result, she knew she had to see Luther’s program. During Johnson’s visit, she played with the Women’s Team and determined that Luther was a place that would challenge her as a player. Johnson studied history and secondary education, sang in choir, and played tennis all four years at Luther. Strand coached Johnson and came to know her and her family well. Johnson mostly played doubles, finishing her Luther career as an all-conference doubles performer in the Iowa Intercollegiate Athletic Conference in the fall of 2015. According to Strand, she was a versatile player and was driven to excel on the court. Johnson fondly remembers her time on the Women’s Tennis Team, especially traveling to Florida with the team for spring break. One year, her family came to watch her play during a Florida tournament. Though her family members rarely got to watch her play, Johnson was still a positive presence on the team, according to former teammate, Annika Peterson (‘19). While Johnson had many positive experiences playing tennis, the summer before her senior year she suffered a painful back injury due to strain and overuse that kept her off the court and in physical therapy for the months before the season started. Johnson was later diagnosed with a herniated disc and two bulging discs in her back. Before this, she had only suffered minor injuries, so the recovery process was new to her. Clinical Education Coordinator and Assistant Athletic Trainer Kris Agena helped Johnson through it. Her strength through the process of healing was inspired by a few of her personal role models: her mother, Wendy, her father, Craig, and Assistant Professor of Music, Jennaya Robison (‘96), who mentored Johnson during her four years of choir. Hailey Johnson plays against the University of Wisconsin-Oshkosh Sept. 12, 2015. Johnson eventually returned to play doubles with her partner, Maggie Knutson (‘16) her senior year. The pair found success during a fall match against a doubles team from Coe College that Johnson had not beaten during her time at Luther. Johnson is currently in her second year of teaching social studies at Regis Jesuit High School in her home state of Colorado. She enjoys the proximity to her family, and the comfort of the place she grew up. She is also the head coach of the girl’s tennis team at Regis Jesuit, enabling her to continue to be engaged in the sport that she loves.